Unless you've been living under a rock, the furore over Blackfriars Bridge has been coming to a head this week after months of sustained campaigning by concerned cyclists. The Mayor of London (and Chair of Transport for London) has described the new designs for the northern junction of the bridge as having "more work needed to be done". 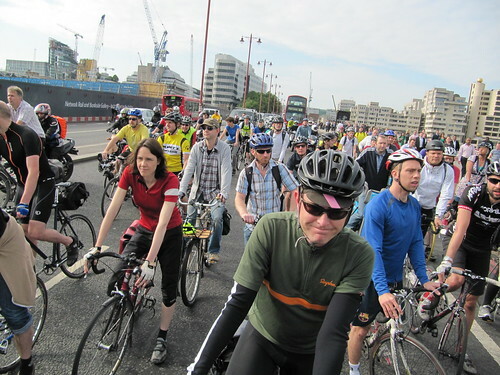 His cycling champion and Conservative Assembly Member Andrew Boff has said of the existing conditions "I am staggered that so many cyclists use Blackfriars Bridge, if it was on my commuting route I wouldn’t because it is too dangerous." He, along with all political parties at the London Assembly, have signed a motion calling on TfL to urgently review their dangerous and poorly designed plans as a matter of urgency and to consider reviewing retaining the 20mph speed limit. Even Transport for London's own safety audit of the scheme has concerns about the width of the cycle lanes which will form part of the junction; teetering along on a narrow cycle lane on a Boris Bike next to 3 lanes of fast moving traffic is hardly an ideal cycling environment. And yet tonight Transport for London - who are unelected and unaccountable - intend to go ahead with their plans. The Huffington Post no less has asked if Boris Johnson is losing control of the city and his transport behemoth. This morning on BBC London Radio Breakfast Show, Ben Plowden (Head of Better Routes at TfL) argued with me that their plans are essential to accommodate the many thousands of pedestrians who will use the new Blackfriars train station. This is a fallacy. Quite how pedestrians are supposed to benefit from increased traffic speed limits, increased lanes of cars and increased exposure to road danger is beyond me. If TfL were really concerned about pedestrians they wouldn't be expecting them to wait at crossings to traverse four to six lanes of fast moving traffic. And as we've always said, it's not just about Blackfriars; this junction is indicative of the kind of thing happening all across London. In the Elephant and Castle in south London the hideous '60s-style roundabout will remain because turning it into a pedestrian square with escalator access to the new Tube station there will 'hold up traffic'. Parliament Square remains a marooned dust bowl of a traffic island because making it a people-friendly environment will 'hold up traffic'. TfL are irrationally obsessed with the smoothing traffic flow agenda, to the detriment of all other road users. Not only are their plans uninviting and uncomfortable they are also unsafe. In the first decade of this new century we should not be designing our cities purely to squeeze as much traffic through as possible despite the consequences, but should be designing our cities for people. After months of campaigning and having exhausted all democratic channels, tonight is the night for Blackfriars Bridge. I hope you will come by foot, come by bike, bring your friends and bring your voices and join us for a go slow 'flashride'. London's press will be there too. If we want a safe city where cycling is for all now is the time to shout about it. Blackfriars Bridge flashride; assemble outside the Doggett's Pub at 6PM on the south side of Blackfriars Bridge. Will be there! Do you know anyone at Guradian bike blog? I'm surprised the demo hasn't been mentioned there yet, even though almost all their writers are based in London. Thanks Nico, look forward to seeing you there. It's now on the Guardian Bike Blog and the Evening Standard and the Huffington Post, and there will be further coverage this evening. Well done guys with the coverage and clearly explaining the problems with the re-development. What about Monday morning? Are there still plans? The facebook group looks hopeful. I have a vested interest because I missed yesterdays protest, but I really enjoyed the first one and want to show my support again. sorry to have missed this - only just saw the post.